We already know about the Verizon/YouTube match up, but now Nokia fans are getting some love too, albeit of a different kind. 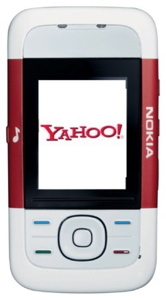 As of today, all of Nokia's Series 40 phones will include integrated versions of Yahoo! Mail and Messenger. The apps will be built right into the UI making it easy to get all those annoying fwds your friends send via e-mail while you're on the go. Add to that the ability to block them while logged onto Messenger and its like you never left your computer. The apps will roll out with the 6300, 5300, and 5200 phones.